Dentist and civil rights leader Daniel A. Collins was born in Darlington, South Carolina, on June 11, 1916. His father ran a heavy equipment company and his mother was a school principal and an ordained minister in the African Methodist Episcopal Church. 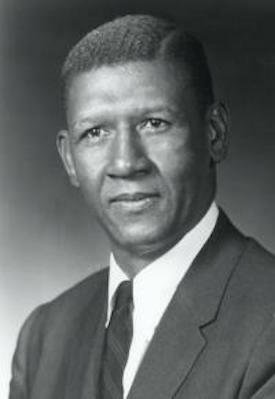 Following high school graduation in 1932, Collins received a bachelor’s degree in science from Paine College in Augusta, Georgia, in 1936 and four years later (1940) he earned a D.D.S. degree from Meharry Medical College in Nashville, Tennessee. In 1944, Collins received a master’s degree in dental science from the University of California, San Francisco, School of Dentistry where he became an assistant professor, the first African American to teach at the dental school. He also opened a private practice in the city. Collins helped establish the Church for the Fellowship of All Peoples in San Francisco in 1944. It was one of the earliest multiracial and interdenominational churches in the United States. Economic opportunity for African Americans was important to Collins. In 1946, he founded the San Francisco branch of the National Urban League, a biracial organization which was devoted to improving black employment prospects. Collins worked at the branch and helped black residents get decent jobs. Many businesses in the city, however, refused to employ African Americans. In 1951, Collins, Urban League director Seaton Manning, and other prominent civil rights activists formed the San Francisco Citizens Committee for Equal Opportunity which subsequently campaigned for a mandatory antidiscrimination ordinance. Although the San Francisco Board of Supervisors did not adopt a fair employment ordinance, some employers signed antidiscrimination agreements with the city government in 1964. Collins also devoted time to education. In 1960, California Governor Edmund G. “Pat” Brown appointed him to the State Board of Education. In 1966, the Board approved a new history textbook for the eighth grade titled Land of the Free: A History of the United States, co-written by noted black historian John Hope Franklin. The book credited the contributions of people of color and women. Collins also served on the board of the National Committee for Citizens in Education. During the 1960s, Collins was very active in the dental profession. He served on the board of directors of the San Francisco Dental Society, was a member of the California Dental Society, and belonged to the trustees of the American Fund for Dental Education. Noted civic organizations were also part of Collins’ career. He served on the board of the National Urban League and was a member of the National Advisory Council on Minorities in Engineering. In 1989, Collins was honored for his exemplary work. The National Urban League awarded him the Whitney M. Young Medallion for his leadership of civil rights. Six years later, UCSF School of Dentistry named him a Distinguished Alumnus. Daniel A. Collins died in Mill Valley, California, on September 13, 2007 at the age of ninety-one. He was survived by four sons, six grandchildren, and three great-grandchildren. Sabin Russell, “Daniel Collins dies – dentist and Bay Area Urban League founder,” San Francisco Chronicle, September 25, 2007; Richard Halstead, “Dr. Daniel Collins, Marin black civil rights leader pioneer, dies at 91,” News, September 27, 2007, marinij.com; Paul T. Miller, The Postwar Struggle for Civil Rights: African Americans in San Francisco, 1945-1975 (New York: Routledge, 2010).